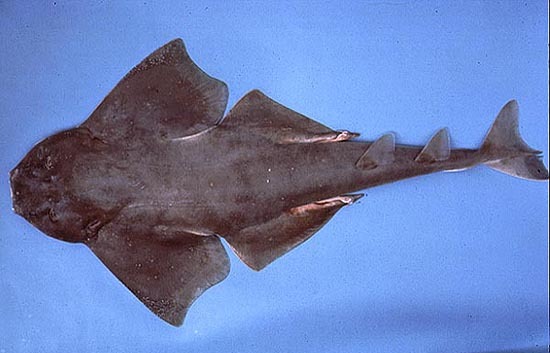 These small sharks look similar to skates, with wide pectoral and pelvic fins extended from the sides of a flattened body, and small dorsal fins on a stout tail near the asymmetrical caudal fin. They are white underneath and medium to dark grey on top with some reddish shading that camouflages them when they’re buried in the sand or mud. They are ambush hunters that prey on smaller bottom-dwelling fish and invertebrates, growing to around 4 feet long but sometimes almost 6 feet long. Common English language names include angel shark, Atlantic angel shark, monkfish, and sand devil. Other common names include, ange de l’ Atlantique (French), ange de mer de sable (French), Atlantinmerienkeli (Finish), karibisk havsängel (Swedish), ryna (Polish), tiburón ángel (Spanish), and zandduivel (Dutch). 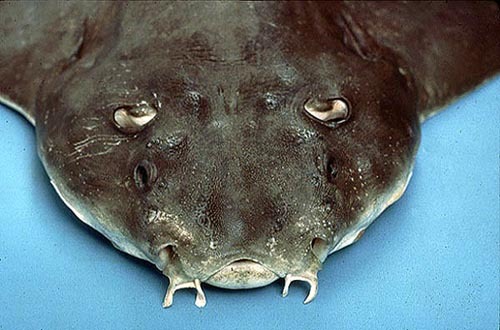 The flesh of the Atlantic angel shark is edible however it is not currently commercially marketed. This species is not known to be overly aggressive, however care should be taken when handling it. The Atlantic angel shark can inflict severe lacerations when provoked. According to the International Shark Attack File there are no reported attacks attributed to this species. The Atlantic angel shark is currently listed as “Data Deficient” by the World Conservation Union (IUCN) as being endangered or vulnerable. The IUCN is a global union of states, governmental agencies, and non-governmental organizations in a partnership that assesses the conservation status of species. > Check the status of the Atlantic angelshark at the IUCN website. 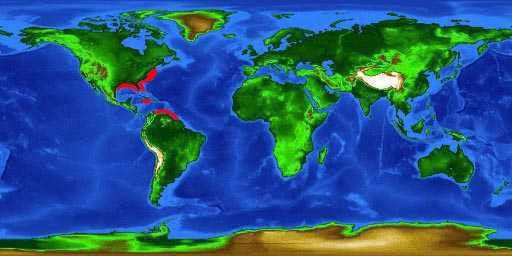 This species resides along the Atlantic Coast of North America, ranging from Massachusetts to the Florida Keys and the Gulf of Mexico. The Atlantic angel shark is also found in parts of the Caribbean and northern South America (Columbia). S. dumeril is considered a bottom dweller. It can generally be located buried in sand or mud at the ocean floor. In the northern areas of its distribution, this shark dwells in swallow water with depths ranging from 131-820 feet (40-250m). It is found in deeper water in the southern portion of its range (to depths of 4,232 feet (1,290m)). 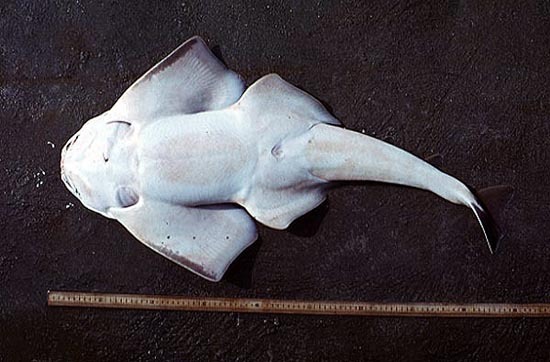 Distinctive features of this shark include its flattened, skate-like body consisting of dorsally located eyes and a terminal mouth. The Atlantic angel shark also possesses large spiracles behind the eyes and expanded pectoral fins, both of which distinguish this shark from other species. This shark also has small dorsal fins of equal size located near the tail. The Atlantic angel shark ranges from a bluish-gray to an ashy-gray in color with a white underside. The head and portions of the fins have a reddish hue. There is a red spot located on both the throat and abdomen. These spots are arranged in an irregular fashion and may also be present over the entire dorsal side. This varied and seemingly sporadic coloring helps to camouflage this species when it is buried within the sea floor. This angel shark has three rows of twenty teeth on the top and eighteen on the bottom. The teeth are conical in shape with broad bases and smooth edges. 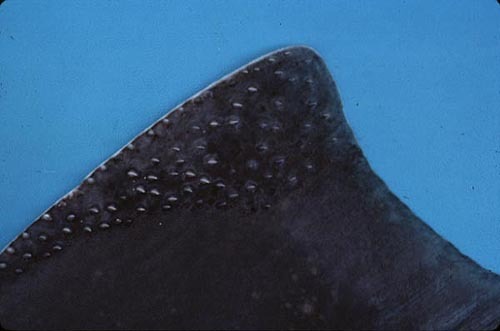 The dermal denticles on the dorsal side are spaced evenly in corresponding rows along the surface. They have broad bases, are conical in shape, and slightly recurved. Around the eyes are larger denticles formed in clusters of 5 or 6. The adult Atlantic angel shark is relatively small, typically ranging from 3 to 4 feet (91-122 cm) in length, although occasionally reaching 6 feet (about 183 cm). The maximum reported length is 5 feet (152 cm) total length. Maturity is attained at 35-41in or (90-105 cm). S. dumeril feeds on a variety of bottom dwelling organisms. Mollusks and crustaceans occupy a large part of the shark’s diet, as do bottom dwelling fishes such as flounders, skates, and stingrays. The Atlantic angel shark is an ovoviviparous species with eggs that develop in enclosed capsules and hatch in the uteri. A litter usually consists of 16 pups, however litter sizes as large as 25 have been reported. Birthing usually occurs in the spring and summer months in depths of 60-90 feet (18-27 meters). 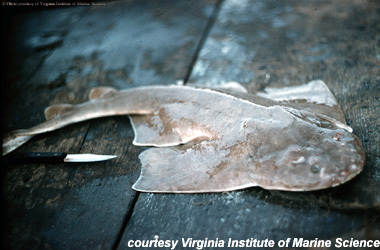 Larger species of fish and marine mammals are potential predators of the Atlantic angel shark. 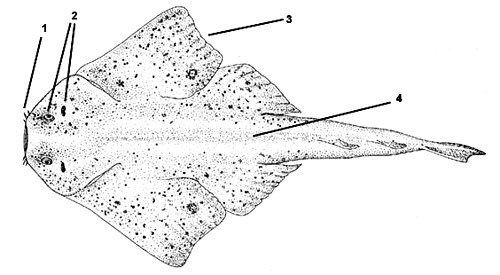 Lesueur first described the Atlantic angel shark in 1818 as Squatina dumeril. The genus name Squatina is derived from Latin, meaning “a kind of shark”. In previous scientific literature, there are no synonyms attributed with this species.